Acting under the umbrella title, “Extinction Rebellion,” on Monday and Tuesday, climate change protesters in London blocked traffic, threw fake blood around, and generally annoyed to people trying to get about their lives in peace. Interviewing a number of protesters who had attached themselves to a truck (yes, you read that right), the BBC recorded a common theme of arguments in favor of necessary disruption. 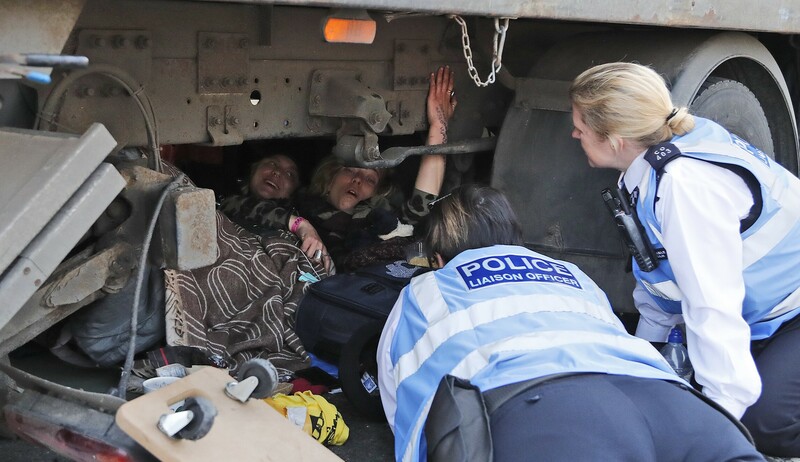 Police officers speak to protesters under a truck, during a civic disobedience event to block Waterloo Bridge in London, Wednesday, April 17, 2019. But these protesters aren’t necessary warriors for the salvation of Earth. They’re simply arrogant, annoying, and presumably unemployed. Note that the protests took place at the start of the working week rather than on the weekend. The arrogance stands out here. After all, the elected British government is pursuing an environment policy in alignment with its pledges. What gives the protesters the moral authority to disrupt the working lives of their fellow citizens simply because they believe the government should do more to reduce carbon emissions? It’s undemocratic and deeply arrogant. Remember, the protesters’ targets here were their fellow citizens trying to travel around London, not government officials. Whatever their claims of earth salvation, there’s also a profound immorality at play here: taking taxpayer funded unemployment welfare while disrupting taxpayers as they work for their families. But maybe I’m missing the point here. Considering that the western climate change movement is defined by socialism far more than it is by science, perhaps it’s unsurprising that these protesters feel an entitlement to stupidity. Fortunately, the police arrested a good number of them. But what will be the result? I imagine that most Londoners will react skeptically to policy proposals from individuals who dress up, deliberately or otherwise, as clowns, then attach themselves to trucks or doorways, block traffic, and bang drums loudly. I suspect Theresa May and the vast majority of Britons will respond to Extinction Rebellion with the same derision.